A brief look at how ties are playing out thus far after the Duterte-Jokowi meeting. This week, Philippine President Rodrigo Duterte made his first-ever visit to Indonesia as part of his maiden international voyage since taking office on June 30 (See: “Duterte’s First ASEAN Tour: What’s on the Agenda?”). With Duterte’s meeting with Indonesian President Joko “Jokowi” Widodo, it is worth looking at how Indonesia-Philippine relations are shaping up substantively so far following Duterte’s election. 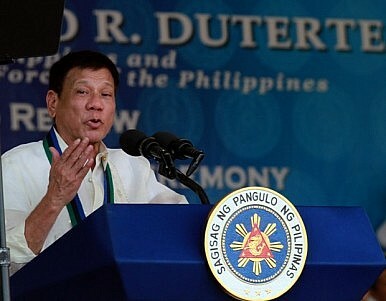 Even before Duterte arrived in Indonesia, his first trip abroad had been mired in controversy, from his remarks directed against United States in Laos – both the insult that was reported as directed against U.S. President Barack Obama as well as his remarks at the East Asia Summit – to bombings in his hometown of Davao City that had caused him to cancel the Brunei leg in his voyage. Substantively, the meeting with Jokowi was pretty much dominated by the same issues that observers had expected. At the top of the agenda was maritime security, which was no surprise considering the spotlight on the recent trilateral patrols agreement reached between Indonesia, the Philippines, and Malaysia amid growing concerns over challenges in the Sulu Sea (See: “Confronting Threats in the Sulu-Sulawesi Seas: Opportunities and Challenges”). The South China Sea was also discussed, which was expected given that the Philippines is one of four Southeast Asian claimants and Indonesia is an interested party (See: “Indonesia’s South China Sea Policy: A Delicate Equilibrium”). But the two sides also discussed exploring the potential for bilateral maritime cooperation as well, including in human resource development, fisheries and aquatic resources, and shipbuilding. Duterte and Jokowi also addressed terrorism and violent extremism. The topic was no doubt fresh in both leaders’ minds, with the attacks in Duterte’s hometown in Davao City and his focus on addressing twin insurgencies centered in the country’s south, and Jokowi’s growing concerns about the Islamic State in Muslim-majority Indonesia (See: “Can the Philippines’ Brash Duterte Also Be a Peacemaker With Communist Rebels?”). Drugs also featured in their conversation, with the two leaders stressing their commitment to a drug-free ASEAN Community (no further details were provided, however, on whether this might feature as one of Manila’s key priorities as ASEAN chair in 2017). Both did touch on the fate of Filipina drug convict Mary Jane Veloso, who is on death row and has grabbed headlines in the Philippines. But Veloso’s case ended up dominating the headlines even more than most expected before the visit, with Indonesian and Philippine accounts initially differing over whether Duterte had given the “green light” for Veloso’s fate (See: “Death Penalty Hangs Over Duterte’s Indonesia Visit“). Following initial reports that Jokowi had given the go-ahead for her execution, presidential spokesperson Ernesto Abella clarified Duterte’s statements and said he had only suggested that he would not interfere in Indonesia’s own legal system. Economics was also a topic of discussion, even though it did not make the headlines. In his statement following the meeting, Duterte said both sides had discussed ways to boost air and sea connectivity and trade and people-to-people exchanges. As I predicted, the Brunei-Indonesia-Malaysia-Philippines East ASEAN Growth Area Initiative (BIMP-EAGA), a subregional initiative founded in 1994 in Davao City, got a mention in Duterte’s statement. The Philippines is chair of BIMP-EAGA beginning in September 2016 and ASEAN chair starting in January 2017, giving the Duterte administration an opportunity to engage on economic issues on both the subregional and regional front. What’s With the New Philippines-Cambodia Military Pact? Both countries concluded a new defense agreement as they took stock of ongoing collaboration this week.